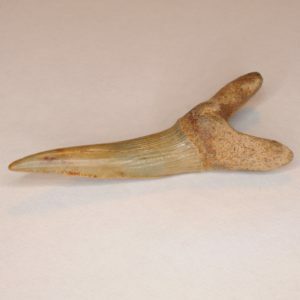 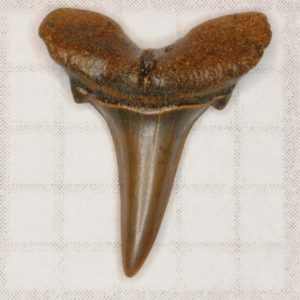 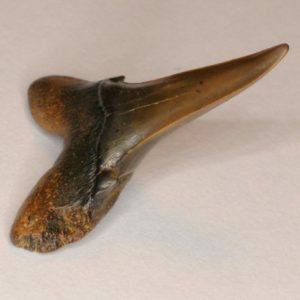 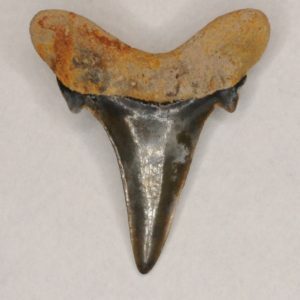 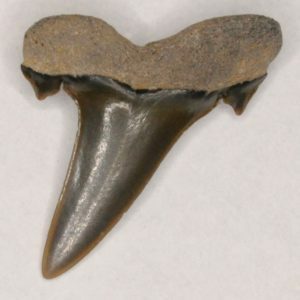 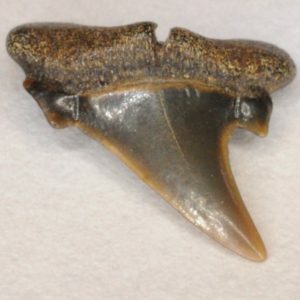 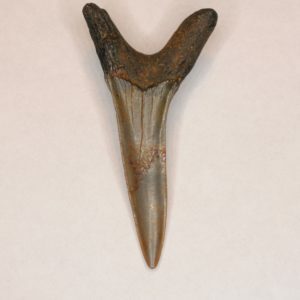 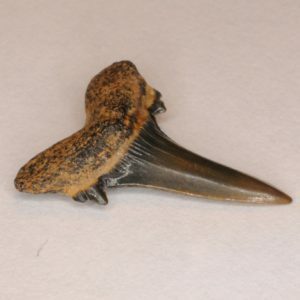 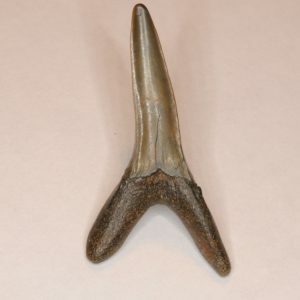 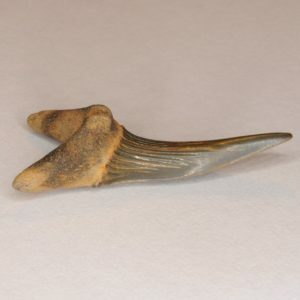 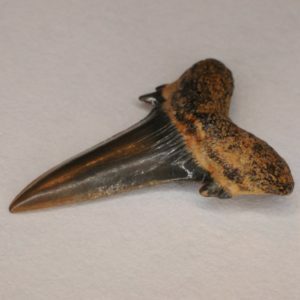 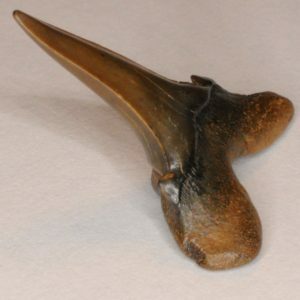 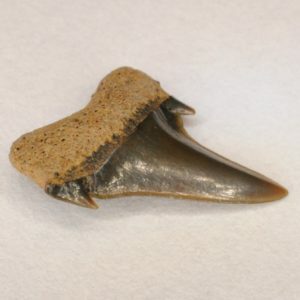 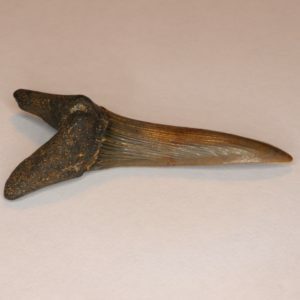 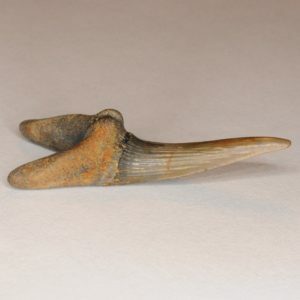 The teeth of the goblin shark are the largest and generally most common find in Monmouth County. 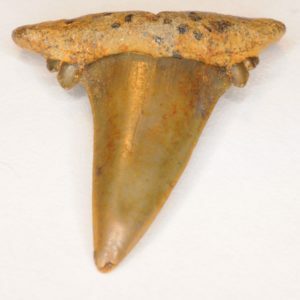 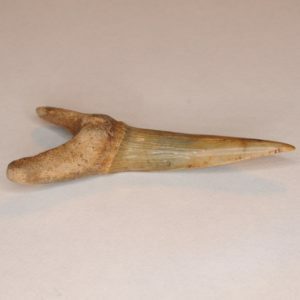 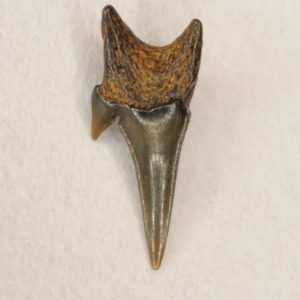 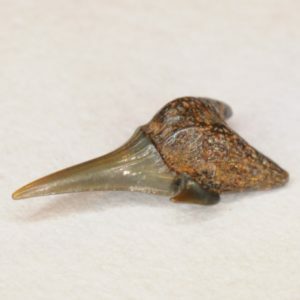 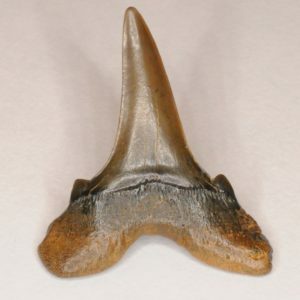 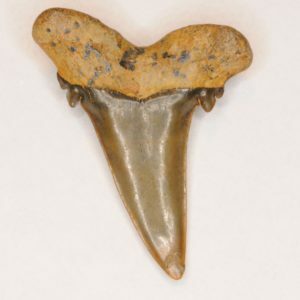 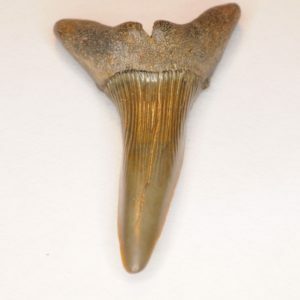 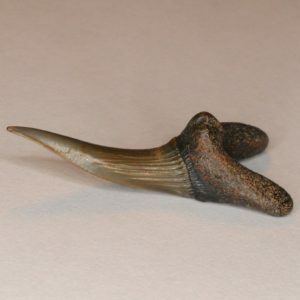 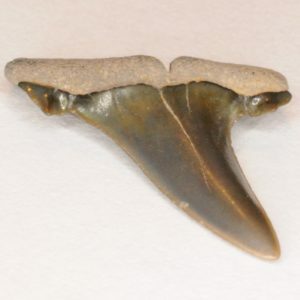 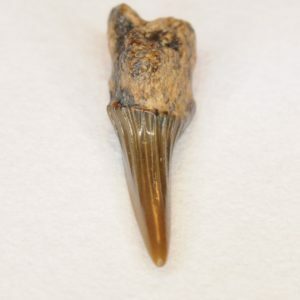 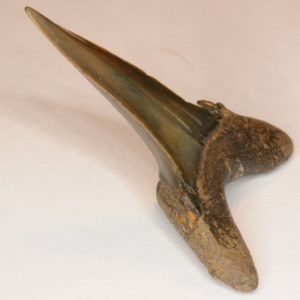 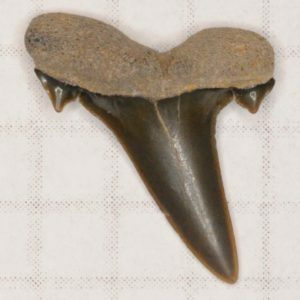 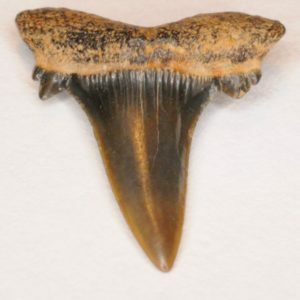 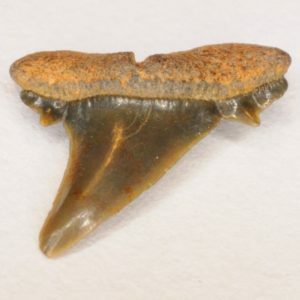 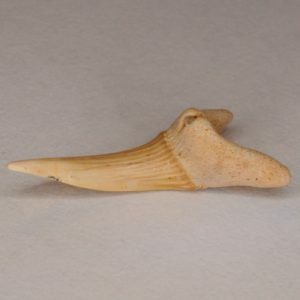 The Goblin shark’s teeth are very distinct compared from the other types found here but can sometimes be confused with a sand tiger or a porbeagle. 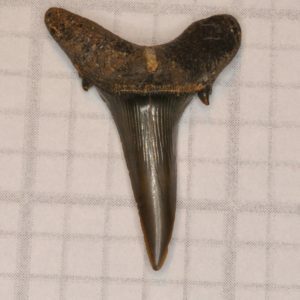 The anterior teeth are long and have striations on them. 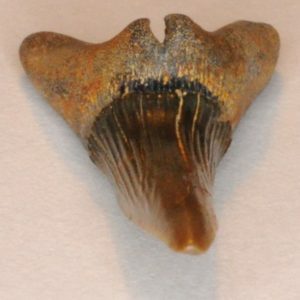 The anteriormost teeth do not have cusplets. 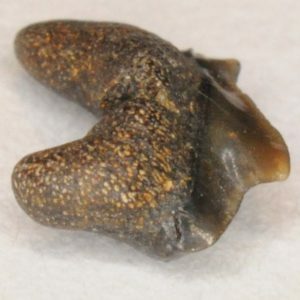 They have a large lingual protuberance and deep nutrient groove. 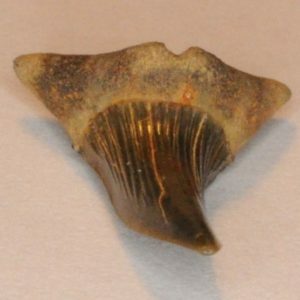 The lateral teeth are broader, slightly shorter, and flatter. 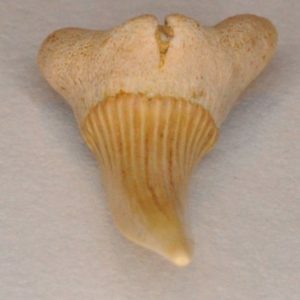 They have two cusplets on each side of the crown and some have one. 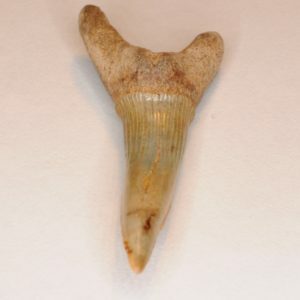 These teeth have a smaller lingual protuberance and a shallow nutrient groove. 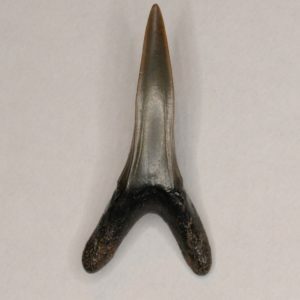 Posteriors are similar to laterals but are even shorter. 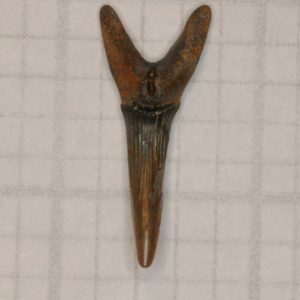 Upper posterior teeth differ from lower posterior teeth in that they are more curved than and not as pointy as the lower teeth. 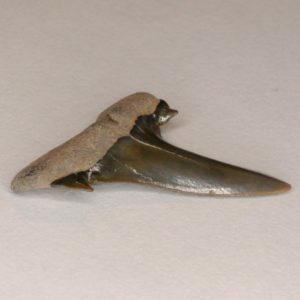 All the lower jaw teeth are normally smaller than the upper jaw teeth (as is with most sharks). 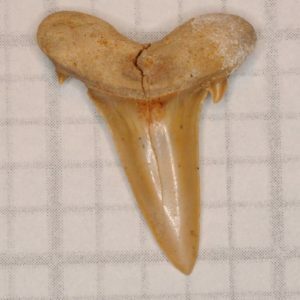 Small symphyseal teeth are present in this species. 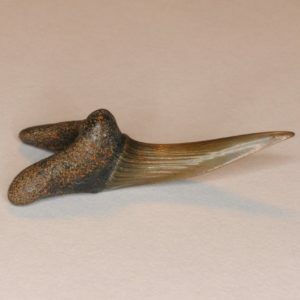 They can take on a variety of forms. 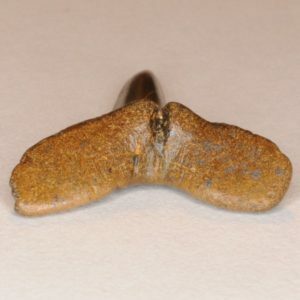 This one is a nice example of uneven root lobes in some symphyseals. 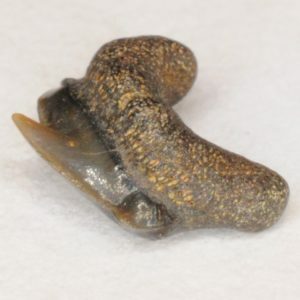 Some symphyseals may possess cusplets. 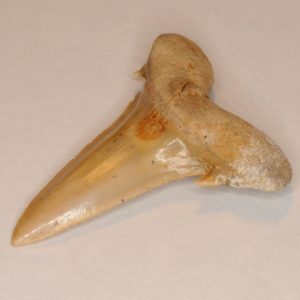 This tooth takes on a classical upper first anterior S. texanus shape. 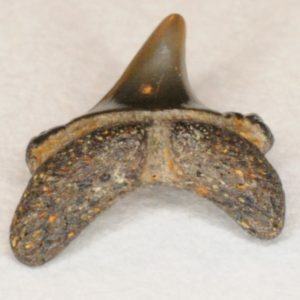 Here is another upper first anterior and is likely from a sub-adult. 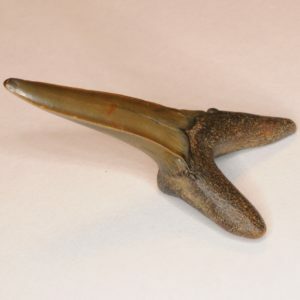 It has a different form from the one above and is more symmetrical. 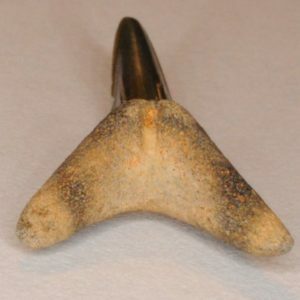 Upper first anterior goblins are symmetrical but have a slight curvature on the distal side of the main cusp. 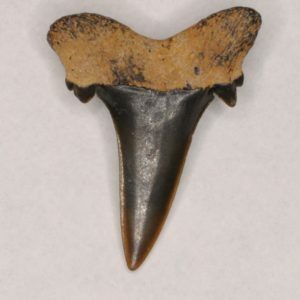 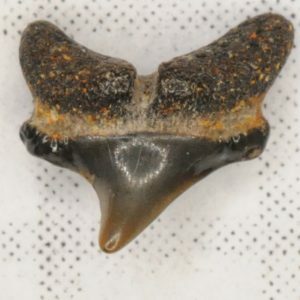 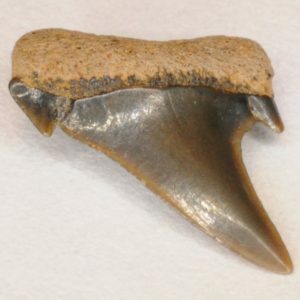 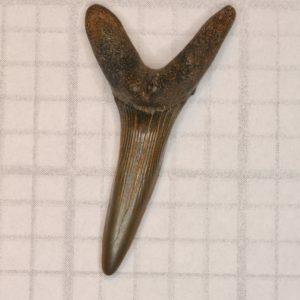 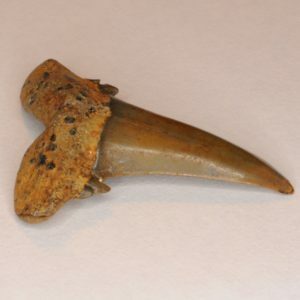 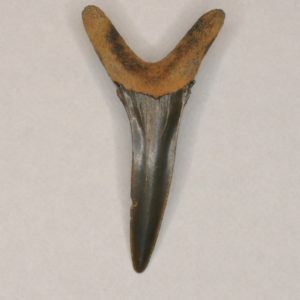 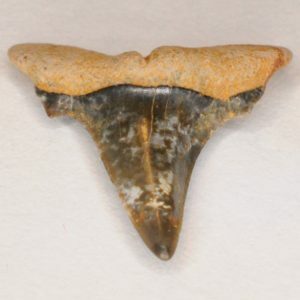 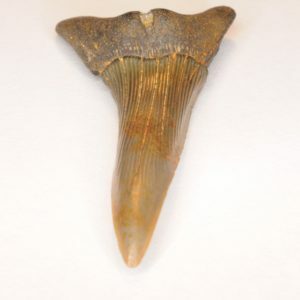 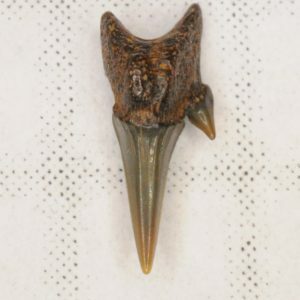 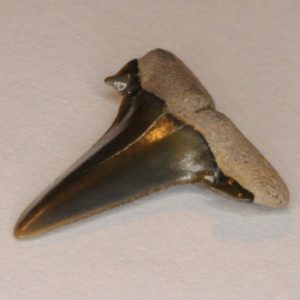 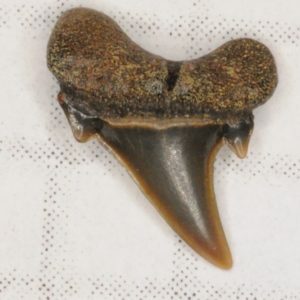 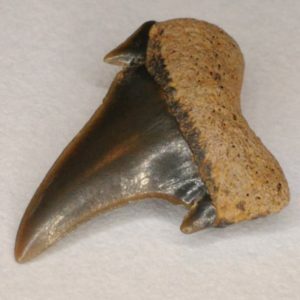 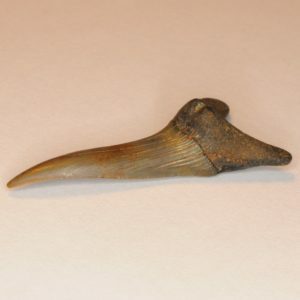 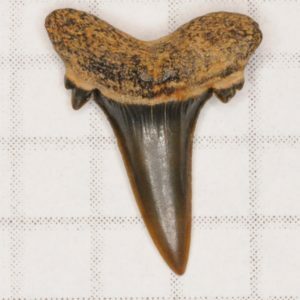 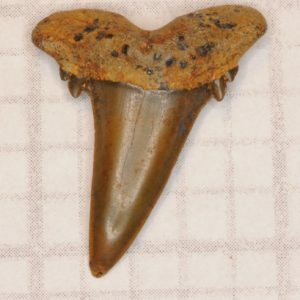 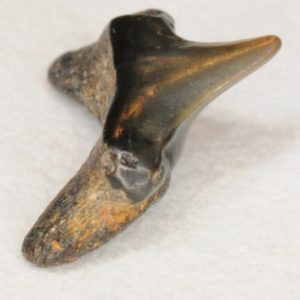 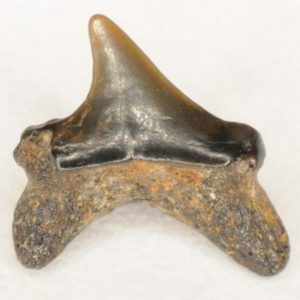 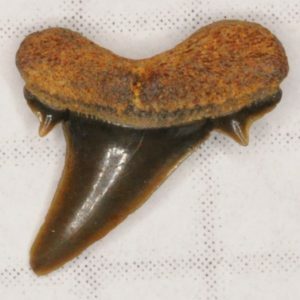 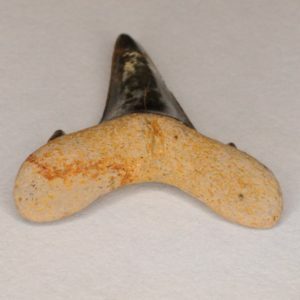 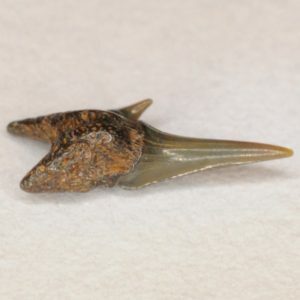 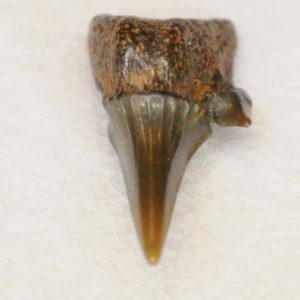 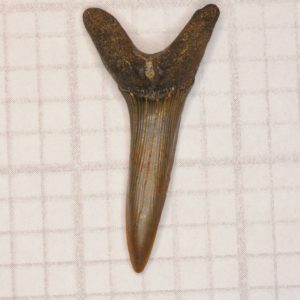 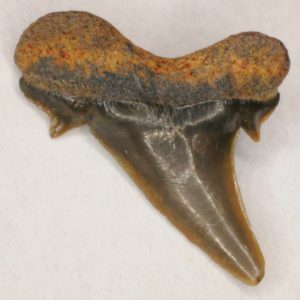 This sub-adult upper first anterior is very likely from a smaller and less developed shark than the tooth above. 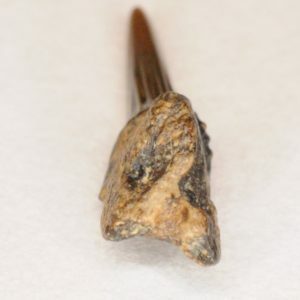 This tooth is an upper second anterior. 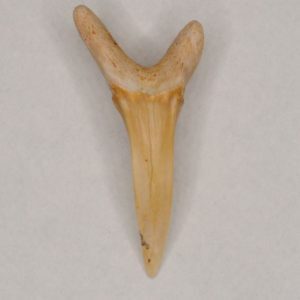 Note how it is less symmetrical and the mesial root lobe is in line with the crown. 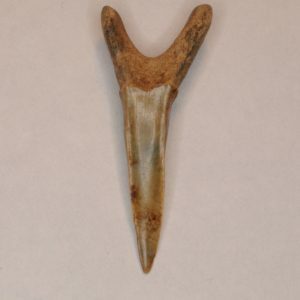 This tooth is an upper third anterior. 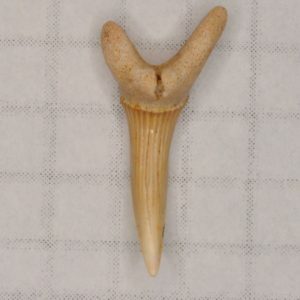 They are generally smaller than the upper 1st and upper 2nd anterior teeth and have cusplets. 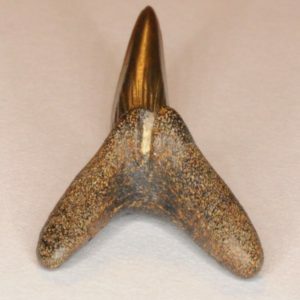 This one is a lower first anterior. 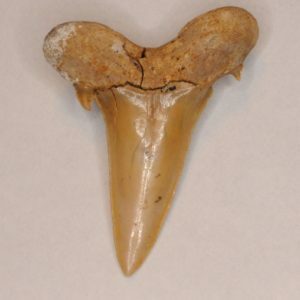 These teeth are symphyseal-like and have fairly asymmetrical root lobes. 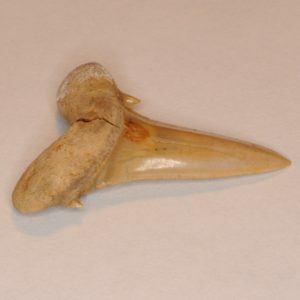 This tooth is a sub-adult lower second anterior. 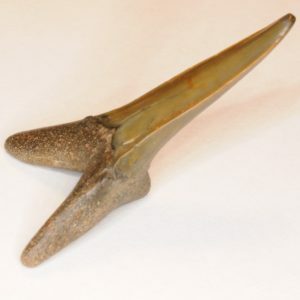 These teeth are the most symmetrical of the anterior (upper and lower) teeth. 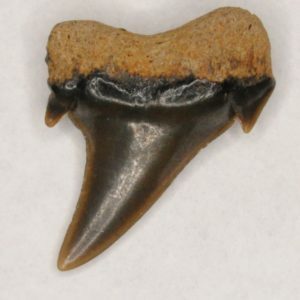 Another sub-adult lower second anterior tooth. 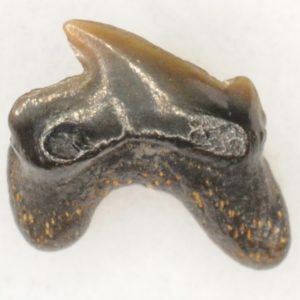 Here is a relatively large lower second anterior. 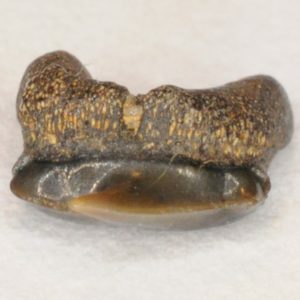 Lower third anterior teeth resemble upper second anteriors, but they have a relatively larger root when compared to overall tooth size, a wider angle between the root lobes, and an overall less flattened shape. 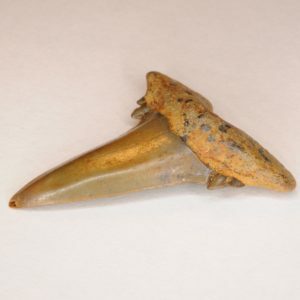 They can also sometimes have cusplets. 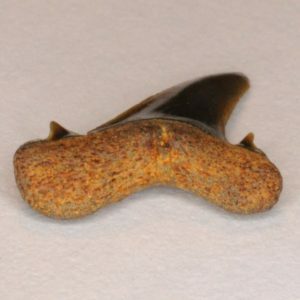 Here is another lower third anterior with a different shape and more prominent cusplets. 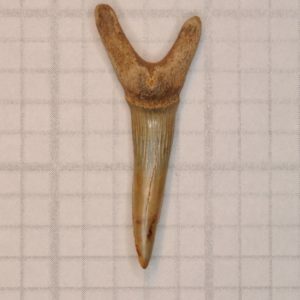 This tooth is most likely a sub-adult lower third anterior. 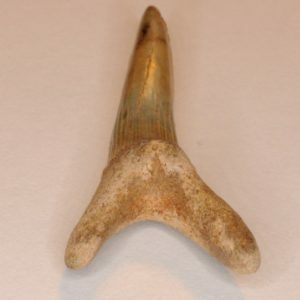 This tooth is a lower fourth anterior. 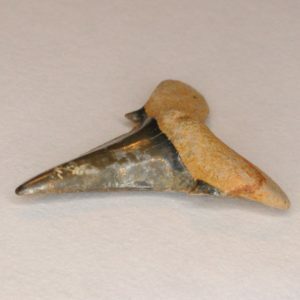 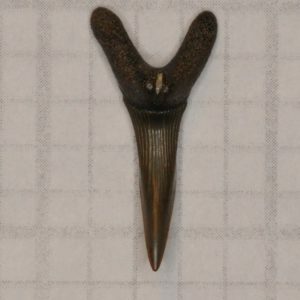 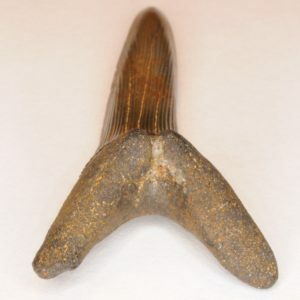 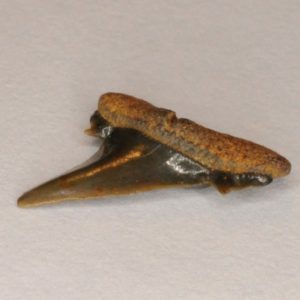 These teeth are more tack-like and can sometimes have cusplets. 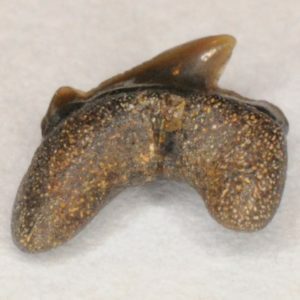 Upper lateral teeth are much more flattened and usually have 1-3 pairs of cusplets, which can be very irregular and amorphous. 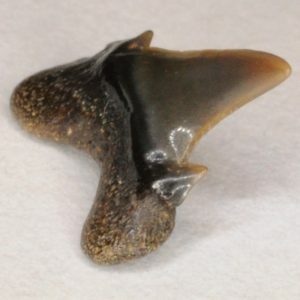 Some juvenile-sub-adult teeth may have striations. 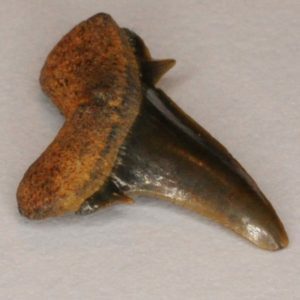 Interesting tooth with a very wide root. 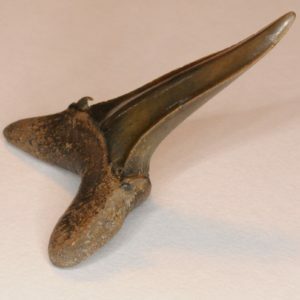 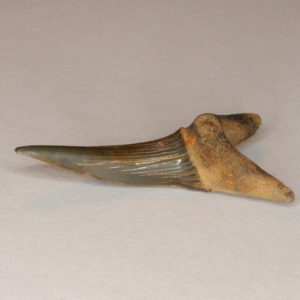 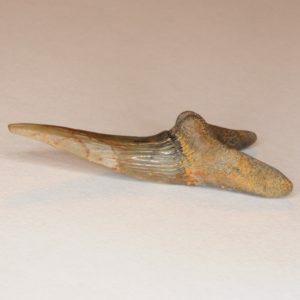 A large upper lateral (possibly an upper fourth lateral) at 3/2 inches. 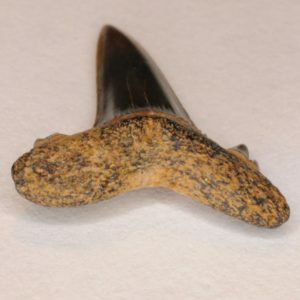 This sub-adult tooth possesses some faint striations. 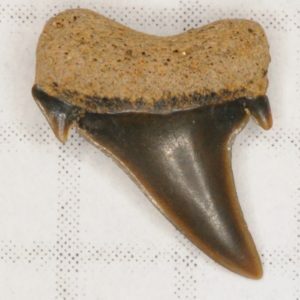 Another sub-adult tooth with more prominent striations. 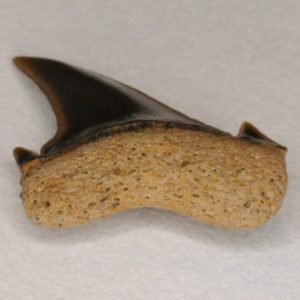 This is another sub-adult upper lateral. 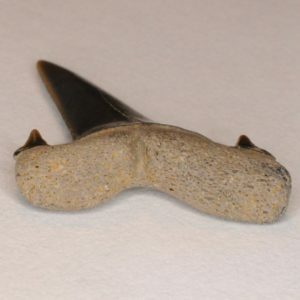 This one is from one of the more posterior lateral positions. 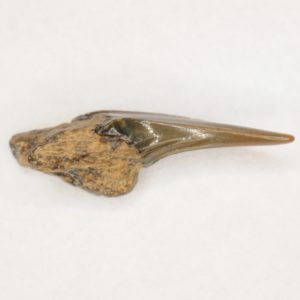 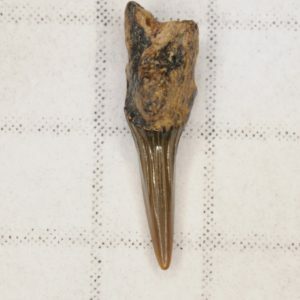 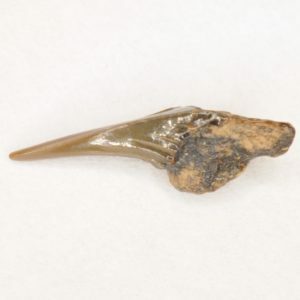 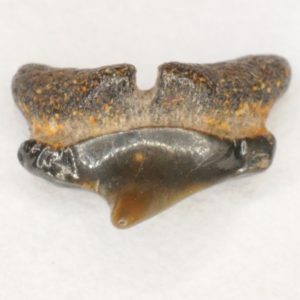 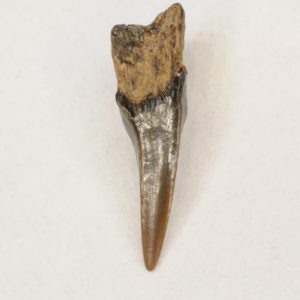 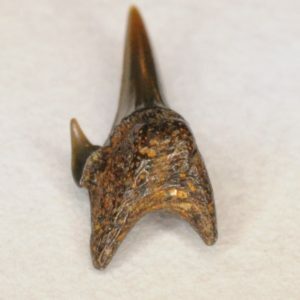 This tooth is very likely from the last upper lateral tooth file (possibly an upper ninth lateral). 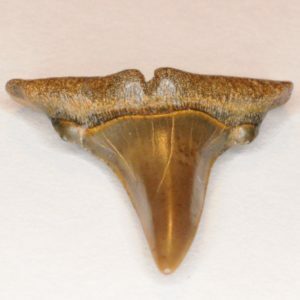 Lower lateral teeth are more tack-like and more symmetrical than the upper lateral teeth. 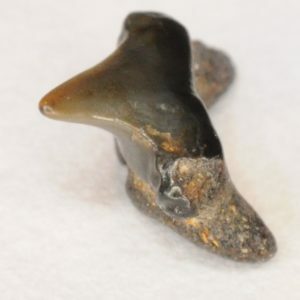 Lower laterals are also much smaller than the average anterior and upper lateral. 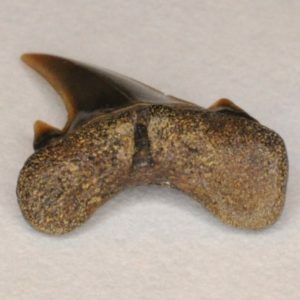 This lower lateral tooth has uneven root lobes. 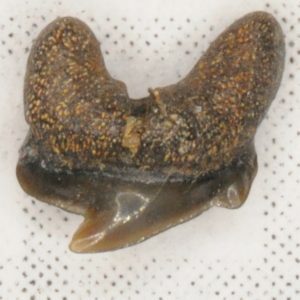 This lower lateral shows a unique feature of Scapanorhynchus. 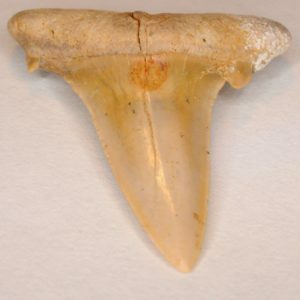 It has small ridges on both the lingual and labial faces of the root area that is closest to the basal margin. 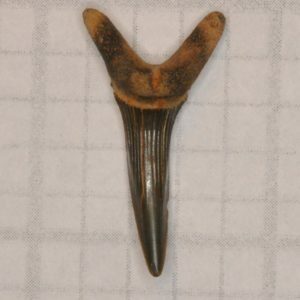 Usually the ridges are present only on the lingual side. 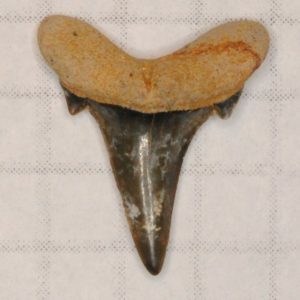 The ridges most commonly occur on the anteriors, but can occur in other positions as well. 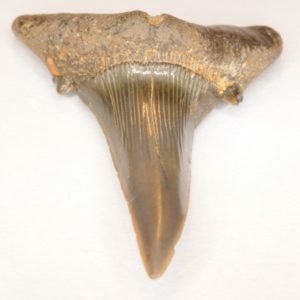 Some teeth (such as the first lower lateral shown on this page) do not have these ridges. 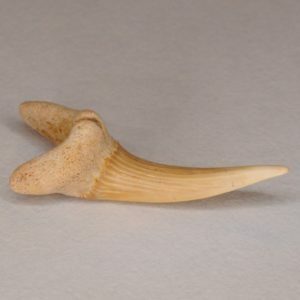 The ridges can sometimes be used to differentiate goblins from various sand tigers (which never have this feature). 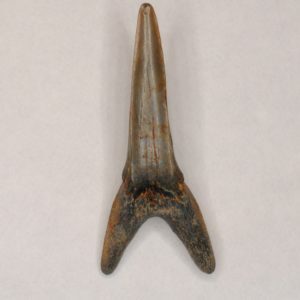 This is an upper first posterior. 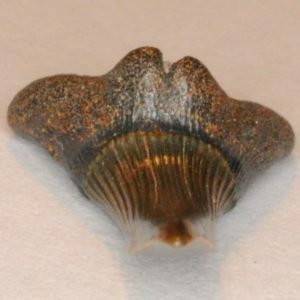 Some posteriors lack nutrient grooves. 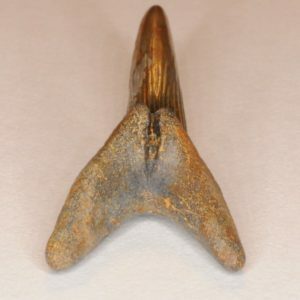 This one is an upper second posterior. 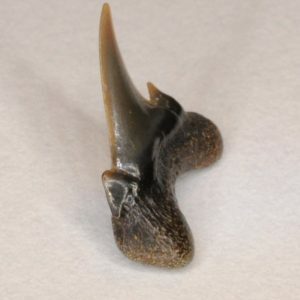 These are much more slanted. 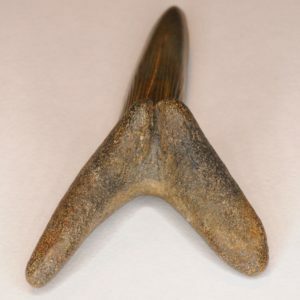 This upper posterior is from one of the last two upper posterior positions and is either an upper fourth or an upper fifth posterior. 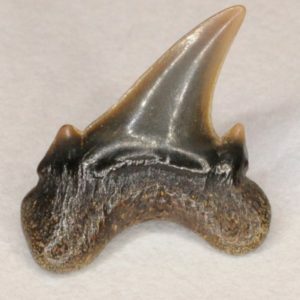 Posteriors (like symphyseals/parasymphyseals) can take on a variety of shapes. 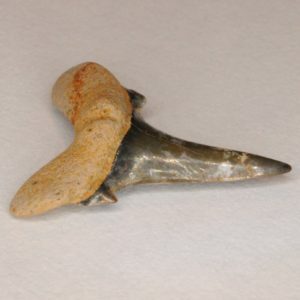 This one has an interesting enameled ledge on the distal side. 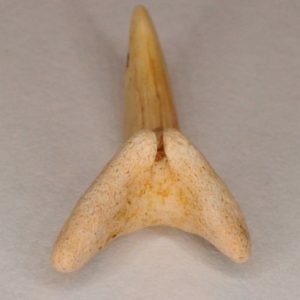 Another upper fourth/fifth posterior with a bit of a different shape. 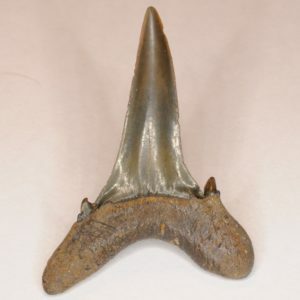 Lower posteriors seem to be less common. 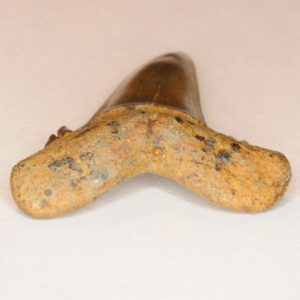 They are more erect (especially lower first/second posteriors) and on average have much more reduced cusplets than upper posteriors. 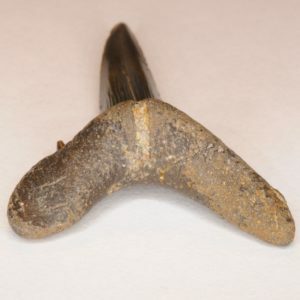 This lower posterior is most likely a lower fourth posterior.